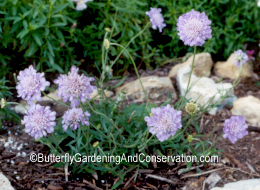 Scabiosa is a great butterfly attracting perennial. Only about 12-18 in. tall, blooms are 2 inches across. Blooms all summer long. Cutting off the dead flowers will help it to continue blooming throughout the summer. Likes full sun. Many varieties are available. The 'Butterfly Blue' variety is what I grow and is pictured to the right. Great nectar source for butterflies. I highly recommend Nature Hills Nursery. Their perennials cost a bit more but they are grown in 4'' x 6'' air-pruned pots that results in healthier plants with a highly developed root mass! The price is reduced however, if you buy more plants. Nature Hills also has a plant and seed catalog that they will mail out to you at no cost. Scabiosa is a member of this family.